Watchdog Online Security Pro is a smart tool which uses multiple antivirus engines to detect threats your regular security software might miss. It's all very easy to use. To get started, just select the "Smart" (quick) or "Deep" (thorough) option, click "Scan", and watch as Watchdog Online Security Pro goes to work. The program crawls over your hard drive, and when it finds something suspicious, passes a fingerprint (not the whole file) to its cloud scanner for further analysis. Watchdog's "Cloud Scanning Platform" then checks your file using multiple antivirus engines, ensuring you'll detect threats that individual packages might miss, before returning its verdict to the program. You don't have to worry about any of the technicalities, fortunately - all you'll see is a report where threats are listed as they're discovered. When the scan is complete, you can browse the report, choose to delete individual items, quarantine them, maybe exclude them if you're sure they're safe, before cleaning up your entire system with a click. 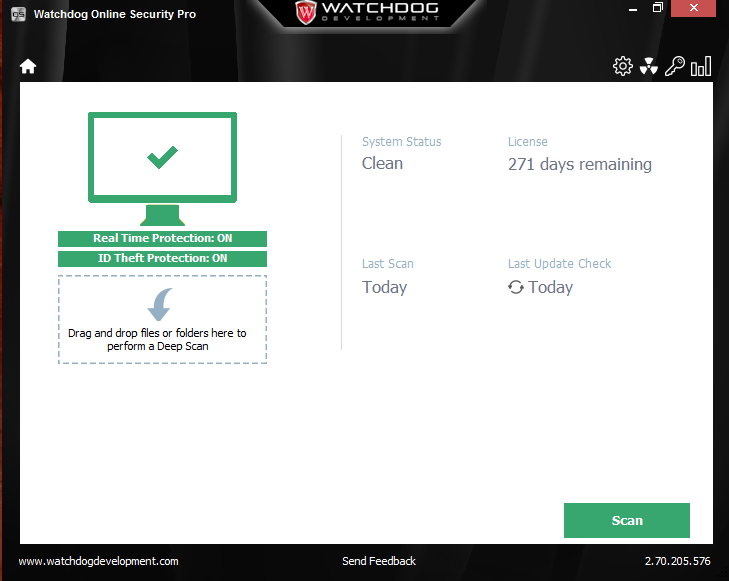 Watchdog Online Security Pro also offers simple real-time protection, analysing files before they're executed, and running a quick "Smart Scan" when your system starts. This worked well for us, but if you don't need that level of protection then it can be tweaked or disabled in the Settings dialog (you might run a Smart Scan every Monday, for example). Watchdog is offering you a full 1-year, 1-device licence, but understands you might benefit from hands-on product installation help, as well as general computing support in future. With this in mind, they are offering Free Installation Support from their Pro Support Team, worth £49.99. Should you need further support with your computer, the Regular Support package offers a one-stop comprehensive system overview, free PC optimisation, virus/antispyware removal or advice and much more. This is available for only £49.99, which is a saving of 50% from the regular price of £99.99. Go to the Watchdog support page for more information.